The Key Deer Refuge was first started all the way back in 1957. The simple idea was to establish a safe refuge to preserve and protect the Deer. This deer is very much like the White tailed deer but is much smaller, even a fully grown adult will only stand about 76 centimeters. So if you are thinking of Disney’s Bambi, then you are not a million miles away. Certainly they are cute, and wonderful to spot as they skip across the paths and undergrowths that crisscross the refuge. This species of deer were almost extinct back in the early 80’s but due to the amazing work the refuge have done, there are now over 800 bounding around happily protected. The deer refuge is based down in the lower Florida Keys and is currently made up of roughly 9,200 acres of prime land that has a great variety of freshwater wetlands, tropical hardwood hammocks, pine rockland forests, salt marsh wetlands and mangrove forests. These little pockets of differing land qualities build up the perfect place for groups of different communities of animals. The habitats are absolutely essential for hundreds of species of creatures including seventeen officially listed species such as lower Keys marsh rabbit, Key deer, and silver rice rat. Within the area sits the alligator holding Blue Hole , an old and no longer used quarry filled with freshwater. At the Blue Hole, visitors can look down from the observation deck to try to spot the only two alligators living in the Florida Keys wilds. Of course, these are just the two most famous of the residents, so make sure you keep your eyes peeled for all the other marsh creatures. It doesn't take long to pass through the visitors centre, so it wont take hours to visit the refuge, but it is certainly a place to savour. But you might be asking whether you have to go to the refuge to see these animals? 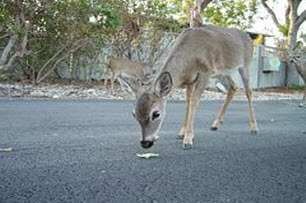 As the deer live close to humans in the Keys it has grown very used to us, and can often be found in backyards and along roadsides where tasty plants and flowers grow, which unfortunately often leads to our furry friends getting hit by oncoming vehicles. If you wish to see the deer away from the refuge then the best places are to head towards No Name Key and the less populated areas of Big Pine Key around dusk and dawn when they get more active. You will be in for a delight as your headlights suddenly reflect against their little eyes, and they come into view.